In this study, it was aimed to investigate the effect of the six days nature education which was named TUBİTAK 4004 "Science and Art Explorers in The Nature” and was organized to improve the environmental awareness and sensitivity of the gifted students, on environmental awareness and concerns of the students. 50 seventh-grade gifted students from Istanbul, Aydin and Tekirdağ were participated in this study. The study was conducted as qualitative study and as data collection tools, two questionnaires consisting of seven open-ended questions were used to determine the environmental awareness and concerns of the students. The data was analysed by descriptive analysis method. After the activities carried out during the project period, it has been determined that the awareness and concerns of the students about the environment consciousness and the environment have improved. Students have stated that environmental education is fun, they learn a lot about the environment, living things and ecosystems together by the activities that they made and they are now more sensitive about protecting the environment. Aydın, F., Coşkun, M., Kaya, H., & Erdönmez, İ. (2011). Gifted students’ attitudes towards environment: A case study from Turkey. African Journal of Agricultural Research, 6(7), 1876-1883. Bakar, F., & Aydınlı, B. (2012). Bilim ve sanat merkezi öğrencilerinin plastik ve plastik atıkların geri dönüşümü ve çevreye etkileri konularında tutumlarının belirlenmesi. 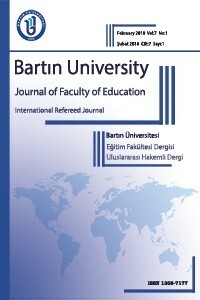 X. Ulusal Fen Bilimleri ve Matematik Eğitimi Kongresi, 27-30 Haziran, 2012, Niğde Üniversitesi. Birinci, N., (2007), Kurum ve kuruluşların ön sözleri, Yeşil Kutu Öğretmen El Kitabı, X-press Baskı, Türkiye. Çağlar, D. (1972). Üstün zekâlı çocukların özellikleri. Ankara Üniversitesi Eğitim Fakültesi Dergisi, Ankara, 5(3), 95 – 110. Clark, B. (1992). Growing up gifted: Developing the potential of children at home and at school(4th ed.). New York: Merrill. Erten, S., (2003). 5. sınıf öğrencilerinde “çöplerin azaltılması” bilincinin kazandırılmasına yönelik bir öğretim modeli. Hacettepe Üniversitesi Eğitim Fakültesi Dergisi, 25, 94-103. Erten, S., (2005). Okul öncesi öğretmen adaylarında çevre dostu davranışların araştırılması. Hacettepe Üniversitesi Eğitim Fakültesi Dergisi, 28, 91-100. Esen, T. (2011). Üstün yetenekli öğrencilerin çevreye yönelik bilgi ve tutumlarının incelenmesi. Yüksek Lisans Tezi. Adıyaman Üniversitesi. Adıyaman. Gould, J. C.,Weeks, V., & Evans, S. (2003). Science starts early. Gifted Child Today, 26(3), 38-42. Hart, P. (2007). Environmental education. In Sandra Abelland Norman Lederman (Eds.). Handbook of research on science education (pp.689-729). New Jersey, USA: Lawrence Erlbaum. Karnes, F. A., & Riley, T. L. (1999). Developing an early passion for science through competitions. Gifted Child Today, 22(3), 35-38. Kopelman, M., Galasso, V. G., & Strom, P. (1977). A model program for the development of creativity in science. Gifted Child Quarterly, 21(1),80-84. Lovecky, D. V. (1993). The quest formeaning: Counseling issues with gifted children and adolescents. In L. K. Silverman (Ed. ), Counseling The Gifted and Talented (pp. 29-47). Denver: LovePublishingCompany. Meador, K. S. (2003). Thinking creatively about science: Suggestions for primary teachers.Gifted Child Today, 26(1), 25-29. Mönks, F. J.,Heller, K. A., & Passow, H. A. (2002). The study of giftedness: Reflections on where weare and where we are going. In K. A. Heller, F. J. Mönks, R. J. Sternberg& R. F. Subotnik (Eds. ), International handbook of giftedness and talent(2nd ed.) (pp. 839-863). Oxford: Elsevier. Neal, P., & Palmer, J., (1994). The handbook of environmental education. Routledge, New York, 9870415093149. Ngoi, M., & Vondracek, M. (2004). Working with gifted science students in a public high school environment. Journal of Secondary Gifted Education, 15(4), 141-147. Piechowski, M. M. (1997). Emotional giftedness: Themeasure of intrapersona lintelligence. In N. Colangelo & G. A. Davis (Eds.) Handbook of GiftedEducation (2nd ed.) (pp. 366-381). Boston: Allyn& Bacon. Sisk, D. (2007). Differentiation for effective instruction in science. Gifted Education International, 23, 32-45. Smutny, J.,& VonFremd, S. E. (2004). Differentiating for the young child. Thous and Oaks: CorwinPress. Sontay, G., Gökdere, M., & Usta, E. (2014). Üstün yetenekli öğrencilerle akranlarının çevresel davranışlarının karşılaştırmalı incelenmesi. Türk Üstün Zeka ve Eğitim Dergisi, 4(2), 90-106. Sontay, G., Gökdere, M., & Usta, E. (2016). Üstün yetenekli öğrencilerle akranlarının çevre okuryazarlık bileşenleri açısından karşılaştırmalı incelenmesi. Türk Fen Eğitimi Dergisi, 13(2), 28-46. Şimşekli, Y., (2004). Çevre bilincinin geliştirilmesine yönelik çevre eğitimi etkinliklerine ilköğretim okullarının duyarlılığı. Uludağ Üniversitesi Eğitim Fakültesi Dergisi, 17(1), 83-92. Taylor, N., Littledyke, M., Eames, C., & Coll, R. K., (2009). An international perspective on the development of environmental education. Environmental Education in Context, Sense Publishers, TheNetherlands, 9789087909611. Uğulu, İ. (2013). Üstün zekalı/yetenekli öğrenciler ile normal gelişim gösteren öğrencilerin çevreye yönelik tutumlarının karşılaştırılması. Buca EğitimFakültesi Dergisi, 35, 1-14. Uğulu, İ., Akkaya, Z., & Erkol, S. (2013). An investigation on environmental attitudes of gifted students and the assessments in terms of some demographic variables. E-Journal of New World Sciences Academy. NWSA-EducationSciences, 8(4), 400-410. DOI: 10.12739/NWSA.2013.8.4.1C0595. Zeleny, L. C., & Schultz, W., (2000). Promoting environmentalism, Journal of Social Issues, 56 (3), 365-371. Winocur, S. L.,& Maurer, P. A. (1991). Critical thinking and gifted students: Using impact to improve teaching and learning. In N. Colangelo& G. Davis (Eds. ), Handbook of Gifted Education(pp. 308–317). Boston: Allyn& Bacon.